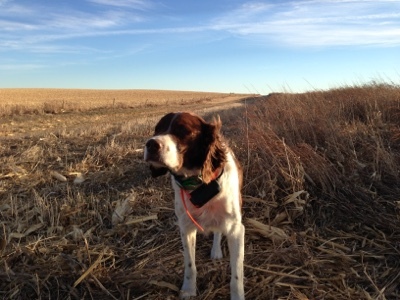 A Bird Hunter's Thoughts: We sat in the sun, and remembered past Octobers. Ace's last hunt. We sat in the sun, and remembered past Octobers. Ace's last hunt. We made a pretty good team, the old boy and me. 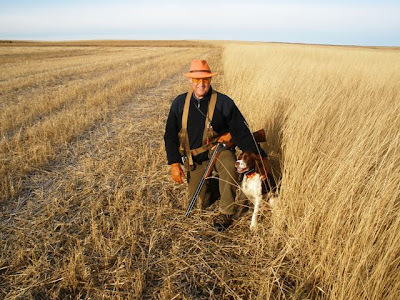 The old dog and I put out on a day that was cool, as the sun was about an hour above the Montana horizon. This was a special spot. Last year, he and I moved 16 coveys of Huns and Sharptails in the Alfalfa fields, along the creek and below the hills that rose up out of the creek bottom. He moved slower now, but still watched me and bounced around, and woofed at me to hurry up. 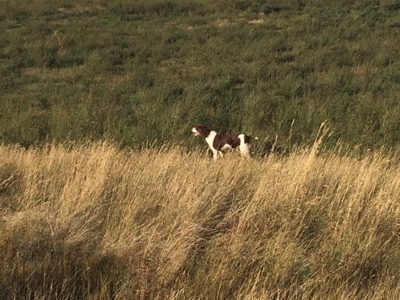 All he needed was for me to take a step in the direction I wanted to go, and he would move out, nose up, quartering in the wind, searching for the scent of whatever game-bird this particular piece of country had to offer. Ten seasons, almost forty trips, over a hundred thousand miles driven, added up to a wise, old bird dog that had seen and done it all. Young boy and a MT Sharpie. As a young dog, he was blazing fast. He never out-ran his nose, and he was all business. In NSTRA trials, he would make an initial cast and loop back around to me as I left the start line. Many was the time the judge would make the mistake of staying with me, instead of going after the brown blur off the line. After a minute, with Ace still gone, I would tell him, "You'd better go find him. If he's not back by now, he's on point." Sure enough, I'd watch the judge head out and eventually raise his hand, "Point! ", he'd yell, and I'd hustle to get to my big Brittany. Now, he wasn't so fast, but the heart was just as big, the desire to please me just as intense. 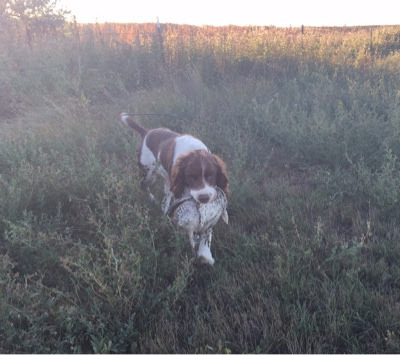 Ace in NE with a pheasant locked down! That incredible nose didn't miss much. We left the truck, and the howling dogs still in their kennels, and I stepped into the knee-deep alfalfa, watching the old dog work the wind. It didn't take long before the head came up, the movement became precise and calculated to put that nose right in the middle of the scent cone. A few minor adjustments and he froze. The point lacked the quivering intensity of past years and, perhaps, some of the style, but the nose was deadly and the knowledge of how to treat these birds was still spot-on. A single bird got up, and the old boy watched it fall and put it in my hand. A stroke on the side of the head, a drink of water, and a "Good boy!" and he was off again, quartering the wind, checking objectives and glancing at me (so quickly, it was hard to catch) to stay in front. After a half-mile of this and another bird in the bag, I gave him a long wail on the whistle to call him in and we took a break on the top of levee. We shared some water, and he allowed as to how I was shooting pretty good today. I accepted the praise gracefully, knowing he's seen quite the opposite many, many times. 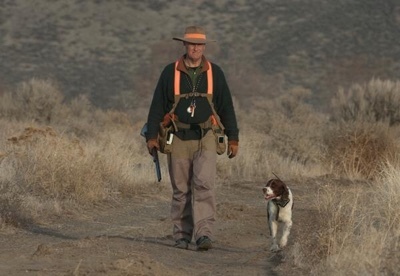 I took off my beat-up hat and thanked God for this old dog and the time I was allowed to hunt with him. We are reminded, in the Book, that life is nothing more than a vapor in strong wind and is over in a flash. How much stronger is the wind regarding the lives of our hunting dogs! A cruel joke, I think, while I struggle to my feet, leaning on the old double gun as the dog takes off into the wind once more. 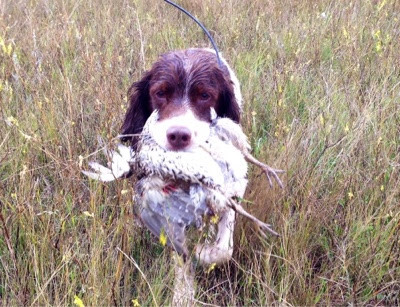 Ace and his last Sharptail. He slowed up considerably and limped constantly, now. But, he knew where he wanted to go to find the birds. It pained me to watch him with the swollen elbow and lack of the grace he had in abundance as a younger dog. Almost to the truck, at the end of the last field, he turned and locked up once again. Breathing hard, I could see he was tiring. The thought crossed my mind, this might be his last hunt. I quickly discarded that notion, "No. Surely he has a few years left in him! ", and quickly walked to where he showed me the bird was hiding. The big Sharpie got up and I unloaded both barrels at him, managing to hit him but not knock him down, He glided down through some trees and in to the field below as I lost sight of him. Ace watched him, too, and looked back at me before trotting down the hill, through the trees and out in to the next field. I quickly followed, not willing to be chastised again by the old campaigner for not keeping up. His nose picked up the scent and he went straight to the bird. He brought it to me and, this time, he set it on the ground and dropped down next to it. 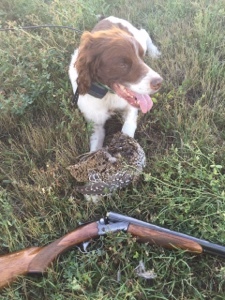 It was the last bird he would retrieve. He's fading fast now, three weeks later. As I wrote this, he walked into my den and lay down at the foot of my desk. The drug patch for pain meds is on his side and his one shaved leg and one bandaged leg both a testament to his last day in the hospital. The doctors called and said there was no hope. I said make him comfortable, I'm coming to take him home. A cruel joke, indeed.